Stay informed: Follow me on Twitter to get the latest updates! Quick Links: Projects | Awards and Recognition | Publications | Lectures | Professional Activities | Teaching | Misc. Gave a well-received Tutorial on Word, Sentence, and Document Embedding Methods at AAAI 2019. The slides are available online. Many thanks to Adobe for an unrestricted gift, for our research on cross-lingual representation. Many thanks to the Hasso-Plattner-Institut for providing compute infrastructure for our research on representation learning services. Very humbled to receive the Rutgers CSGSS Best Professor Award, along with Yongfeng Zhang, in the Teaching, Advising, and Overall categories. At this point, I am not really sure I deserve this award, but I will consider this an additional reason to work hard and live up to the award in the future. Congratulations to Tugba Kulahcioglu for her Nomination for Best Paper at the 12th IEEE International Conference on Semantic Computing, Laguna Hills, CA, 2018. I am happy to be serving as PC Co-Chair for the Language, Data and Knowledge conference (LDK 2019), together with Maria Eskevich. Also, I am co-organizing the Workshop on Deep Learning for Knowledge Graphs and Semantic Technologies (DL4KGS) at ESWC 2018 and serving as Workshop Co-Chair for the 13th IEEE International Conference on Semantic Computing (ICSC 2019). Acknowledged as Distinguished Senior PC Member for IJCAI 2018 and as Outstanding Reviewer for NAACL-HLT 2018. Congratulations to Xiang Long for winning the ActivityNet 2017 Kinetics challenge! Find out more about the details of the approach in our CVPR paper. Congratulations to Xiang Long for winning the 3rd Prize ($20,000) in the Google Cloud & YouTube-8M Video Understanding Challenge! Find out more about the details of the approach in our AAAI 2018 paper. Our deep neural information retrieval model PACRR was the backbone for the top-ranked TREC 2017 Complex Answer Retrieval submissions! Congratulations to Qian Yang for receiving a Google Women Techmakers Scholarship! Just found out that Google Translate is using our OpenWN-PT project. Great to see our work contributing to helping people understand each other. Dear Students: Please contact me if you are interested in research projects related to web mining, natural language processing, or machine learning! From 2013 to 2016, I was an Assistant Professor heading the Web Mining and Language Technology group at Tsinghua University, which is generally considered mainland China's #1 Science & Engineering university, and ranks 1st in the world in the U.S. News & World Report Computer Science ranking (2019), 9th in the world on CSRankings.org (as of 2019-04), 14th in the world in the Times Higher Education World University Reputation Ranking 2018, and 17th in the world in the QS World University Ranking (2019). This was as part of the Institute for Interdisciplinary Information Sciences, which is led by Turing award winner Andrew Yao and conducts interdisciplinary computer science and quantum computing research. Before that, I spent two years as a post-doctoral research scholar at UC Berkeley working in the AI/FrameNet group at the International Computer Science Institute (ICSI). I also spent 4 months at the Machine Learning and Perception Group (headed by Christopher Bishop) at Microsoft Research Cambridge, working with Thore Graepel and Gjergji Kasneci. Prior to that, I was a member of the Databases and Information Systems Group headed by Gerhard Weikum at the Max Planck Institute for Informatics, receiving my doctoral degree from Saarland University, Saarbrücken, Germany in 2010. I am leading the Deep Data Lab, which currently consists of 7 PhD students, plus a few master's students and undergraduates. We conduct interdisciplinary research in computer science and beyond. The vision driving this research is the idea that there is now so much digital data out there that machines ought to be able to learn to guide us in almost every aspect of our daily life, e.g. by addressing our information needs and helping us make more informed decisions. This, however, requires novel algorithms that simultaneously learn and integrate information from multiple heterogeneous data sources in order to make sense of human language and more generally of the world. 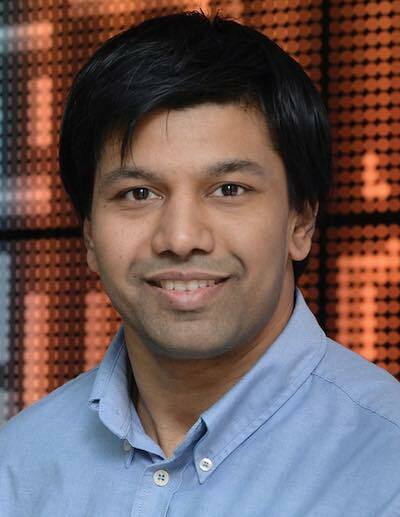 Get in touch with me if you are seeking PhD or Post-Doc opportunities at one of the top universities for computer science research, located in the Greater New York region, which is currently one of the most exciting areas for artificial intelligence and data science in the world. UWN/MENTA: One of the largest multilingual knowledge graphs, transforming the well-known WordNet database into a massively multilingual resource covering over 1 million words and several million named entities in a single semantically organized hierarchy. Our derivative project OpenWN-PT is being used by Google Translate. Lexvo.org: Contributes information about words and other language-related entities to the Linked Data Web and Semantic Web, leading to a Web of Data in which the British Library, the Spanish National Library, and others have linked their data to Lexvo.org, and Lexvo.org in turn connects its own data to other valuable resources. YAGO-SUMO Integration: An ontology providing an enormous body of axiomatized world knowledge based on YAGO as well as the Suggested Upper Merged Ontology (SUMO). YAGO was used in IBM's famous Jeopardy!-winning system Watson. FrameBase: FrameBase uses frame semantics, a theory of natural language semantics, to represent knowledge about the world in a consistent way. I also developed a new browsing interface for the FrameNet lexical resource, which FrameBase relies on. WebChild: Large amounts of common-sense knowledge extracted from the Web. 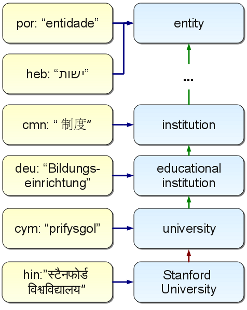 Etymological Wordnet: A database of etymological and derivational relationships between words in different languages, mined from Wiktionary. PEAK: Pyramid Evaluation of summary quality using Automated Knowledge extraction — A method for evaluating the quality of a summary (e.g., one written by students) using the Pyramid method, which is known to be significantly more reliable than the ROUGE method when evaluating individual summaries. Programming Languages: Scala, Java, C#, C++, Python, etc.